Late 2016 was a busy time for DDoS on multiple fronts. As an industry we experienced unprecedented DDoS attacks on OVH, Krebs, and Dyn that were driven by IoT botnets. As a company, Kentik announced ground-breaking DDoS detection capabilities in Kentik Detect. Drawing on our big data scale and our learning algorithms for baselining, we’ve now proven in the field that we can catch significantly more attacks than traditional approaches. 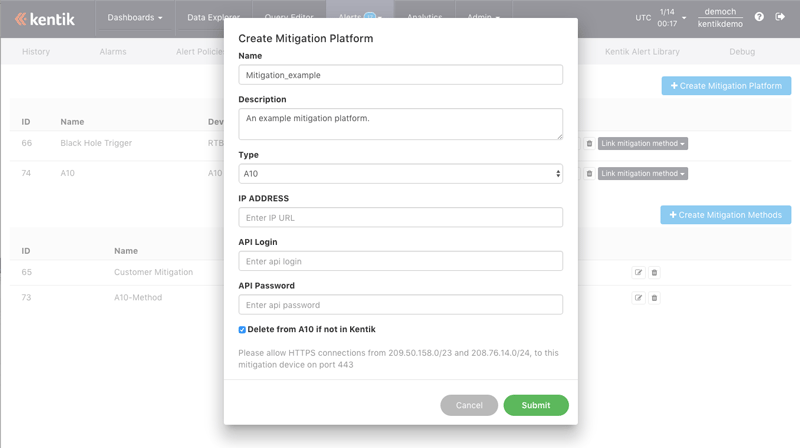 Furthermore, we’ve enabled Kentik Detect to trigger hybrid mitigation, including support for “free” methods like RTBH as well as for integrations with industry-leading mitigation solutions. All of which brings me to the topic of today’s blog post. While we’ve previously made public reference to the fact that Kentik has been working with A10 Networks, and today we are proud to formally announce both the partnership and our field-ready integration between Kentik Detect and the A10 Thunder TPS mitigation solution. A10 solutions help protect some of the world's largest networks. A10 Networks is a networking industry leader, and their series of application networking, load balancing, and DDoS protection solutions accelerate and secure the applications and networks of the world’s largest enterprises, service providers, and cloud platforms. A10’s marquee customers include Yahoo, Box, GoDaddy, Ericsson, and Subaru. The fact that we had number of customers in common meant that we started seeing A10 Networks regularly in client accounts. Eventually, a mutual customer asked for deeper integration. The result was a project to connect Kentik’s industry-leading DDoS detection and automated notification/triggering with A10’s advanced DDoS mitigation capabilities. Working with A10, we’re now able to support some exciting functionality, like triggering Thunder TPS’ dynamic mitigation, which escalates suspect traffic through progressively tougher countermeasures to minimize impact on legitimate traffic. We’re pumped up about sharing the powerful new “one-two” punch of Kentik+A10, which will help organizations of all sizes achieve the higher degree of DDoS protection that 2017 is going to demand. If you’d like to find out more about how Kentik Detect integrates with A10 Networks Thunder TPS solutions, check out the joint solution brief, or to schedule a demo. Or you can experience Kentik Detect for yourself by signing up online for a free trial.